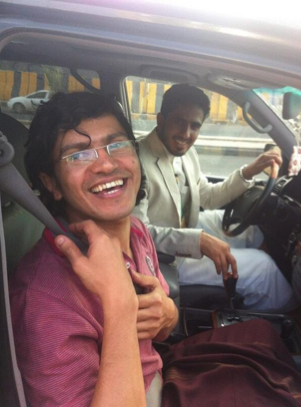 Yemeni journalist Abdulelah Haider Shaye, who United States President Barack Obama had been keeping in prison, has been released. Shaye was apparently given a presidential pardonthat requires him to remain in Sanaa for two years. This means he would be prohibited from traveling to many of the areas where US drone strikes have taken place while he was in prison or where they will take place over the next two years. Craig acknowledged that Yemen President Abd Rabbuh Mansur Hadi deserved credit for keeping his word and releasing Shaye. She also praised the organization, Index on Censorship, in the United Kingdom for calling attention to “Shaye’s long-running story” and the threat his imprisonment posed to freedom of expression. [Shaye] is one of those who got all of the information quickly and put it out there for the public. His work actually impacted the Yemeni government and US government in ways where they didn’t want to see it. The Yemeni intelligence were trying to actually recruit Shaye and have him work in the intelligence but he refused. So, after the attack on al-Majalah where so many civilians including women and children were murdered, Abdulelah was beaten up and kidnapped [in June 2010] by the national security agency and he was asked to shut up and be silent and not to talk about these kind of issues. This did not stop Shaye from practicing journalism. In August 2010, Barman told Firedoglake Shaye was kidnapped by national security agency people. He was beaten and dragged to “national security cars.” He was held for thirty-five days incommunicado while activists protested his detention in front of intelligence services and judicial system buildings. These agencies claimed they had not detained him, but he discovered his location through a released prisoner, who had seen him one of the cells. This led to the national security agencies transferring him to another location. Barman eventually was able to be with him during interrogation and he said there was no evidence against him for the terrorism-related charges he faced. Shaye was held in solitary confinement for a period, denied access to his lawyer, and subjected to psychological torture and abuse and appeared in a cage before a special tribunal on September 22, 2010. The judge read the charges he faced, which included “being the ‘media man’ for al Qaeda, recruiting new operatives for the group and providing al Qaeda with photos of Yemeni bases and foreign embassies for potential targeting. In January 2011, he was convicted and sentenced to five years in prison and two years of house arrest in his hometown. Shaye went on hunger strike in November 2011 and support for his release increased. Yemeni activists protested in front of the US embassy and, finally, Ali Abdullah Saleh, the president of Yemen at the time, was willing to release him. But he received a phone call from President Obama who opposed his release. In May of this year, Craig reported that Hadi had confirmed there was “an order from the president to release” Shaye “soon.” However, no details were given on when he would be released. Craig recounted how the US Ambassador to Sanaa, Gerald Feierstein, had told her, “Haidar Shaye is in jail because he was facilitating al-Qaeda and its planning for attacks on Americans and therefore we have a very direct interest in his case and his imprisonment,” despite the fact that no evidence confirming this allegation had ever been presented. Yemeni journalists have repeatedly expressed their lingering fear over America’s meddling in Shaye’s case. Many became afraid to report on air strikes. One Yemeni journalist, like Shaye a specialist on al-Qaeda, renamed himself an “analyst of Islamic groups” and refused to do TV interviews especially with Al Jazeera after what happened to Shaye. What effect his imprisonment will have on him as he resumes life obviously remains to be seen, but one hopes he has not lost his spirit and commitment to journalism and, despite restrictions on traveling outside of Sanaa, will eventually return to doing what he was doing before he was unjustly imprisoned at the behest of the Obama administration. It takes courage to do what Shaye was doing before he was imprisoned in Yemen. Sadly, when he wound up in prison, US media outlets virtually abandoned him. He had contributed to outlets such as theWashington Post and ABC News but they apparently did not ever find it appropriate to raise their voices to get answers from the administration on why a journalist was being kept in prison. In solidarity, it is good to see Shaye be freed. Obama owes Shaye an apology and reparations of some kind for depriving him of the years of his life that he spent in prison and could not be with his family or out in the field doing journalism. Unfortunately, as much as the administration may claim to support press freedom, it is pretty much a certainty that there will not be a peep from the Obama administration where they acknowledge it was wrong to keep Shaye jailed.